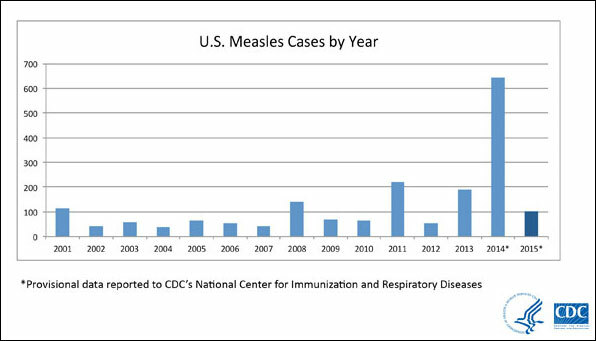 The United States has recently seen a significant rise in the number of cases of vaccine-preventable diseases such as measles, mumps and pertussis, or whooping cough. In early 2015, cases of measles traced back to Disneyland visits have continued to stir up debate and raise awareness about a growing trend of child vaccination “noncompliance” by parents. A Pew Research Center January 2015 report suggests shifting patterns in terms of support for mandatory vaccinations, with younger Americans less likely to support requiring vaccinations. Meanwhile, since the Disneyland outbreak, legislators in a few states have debated whether families should continue to be allowed personal and religious exemptions from childhood vaccinations. In June 2015, California Gov. Jerry Brown signed a law requiring all children who attend public and private schools or day cares in that state to be vaccinated against whooping cough, measles and other diseases starting July 1, 2016. The trend has been unfolding even as the benefits of vaccination remain indisputable: The Centers for Disease Control and Prevention (CDC) states that “among children born during 1994–2013, vaccination will prevent an estimated 322 million illnesses, 21 million hospitalizations, and 732,000 deaths during their lifetimes.” Experts note that noncompliance with MMR — measles, mumps and rubella — vaccination coverage for children can sometimes be found in community “clusters,” although in the majority of states target coverage rates of 95% are still being met and most meet the 90% standard. Coverage rates must remain in the 92-94% range to ensure “herd-immunity” against measles, which involves maintaining a threshold level of vaccination across a community that protects even the unvaccinated. Measles outbreaks not only put lives at risk but also cost the public health sector an estimated $10,000 or more per case. Some researchers have shown the costs being higher, especially for cases of measles acquired through foreign travel: $25,000 or more because of a single case in Kentucky; more than $140,000 and 2,500 hours of public health workers’ time for three cases in Iowa; and an estimated $800,000 to investigate 14 cases in Arizona, all related to a single contagious traveler from Switzerland in 2008. 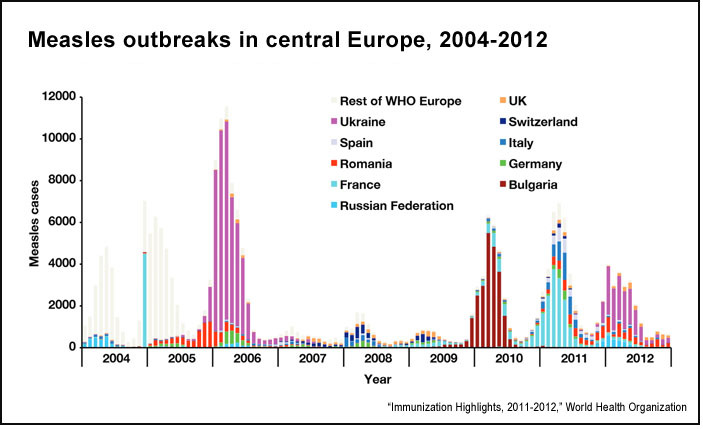 Since 2006 significant measles outbreaks have occurred in Bulgaria, France, Ukraine, Georgia, Turkey and other countries, often beginning with a small number of infections that rapidly ballooned into a large number of cases. France went from 40 reported cases in 2007 to 15,000 in 2011, an epidemic wave also triggered by deliberate noncompliance. Were a similar pattern to unfold in the United States — and the CDC continues to follow and report on outbreaks — the potential public health costs could be in the hundreds of millions of dollars. The public health community within the U.S. government continues to make the case for funding and supporting global immunization programs. Also see the related article “Addressing Vaccine Hesitancy,” by report co-chairs Barry R. Bloom of the Harvard School of Public Health, Edgar Marcuse of the University of Washington and Seth Mnookin of MIT. The beginning of this misinformation problem, researchers say, dates back to 1998, when a now-discredited scientific paper was published in Britain linking vaccines to autism, a link that was proven entirely false and even labeled “fraudulent.” A number of activists and some celebrities have adopted prominent anti-vaccine positions, and media and entertainment outlets have provided a platform for some of their views. Further, the data show that a “dramatic narrative about measles and images of sick children” actually ended up increasing misperceptions about MMR. Further reading: A 2014 paper in the Annual Review of Public Health, “Personal Belief Exemptions from School Vaccination Requirements,” provides a deep analytical history of parents opting out from having their children vaccinated, despite state rules. A November 2015 study from the University of Pennsylvania, “‘Everybody Just Wants to Do What’s Best for Their Child'”: Understanding How Pro-Vaccine Parents Can Support a Culture of Vaccine Hesitancy,” offers insights into vaccine refusal and why even pro-vaccine parents deviate from the recommended vaccination schedule. From a communications standpoint, there is a wider literature that may be of interest. Research has found that correcting misinformation is a significant challenge because of certain deep cognitive biases and processes. Distorted claims, once aired, appear to be relatively “sticky,” despite efforts to debunk them. But this is both a media/communications and audience issue: It is also worth investigating underlying cultural currents to explain which types of citizens might become more susceptible to anti-vaccine misinformation. Levels of belief in science have varied across political groups historically, for example, and new movements around health, food and living may contribute to new attitudes. Social scientists continue to examine the responses of different groups around issues of risk perception. Finally, polio is another highly infectious disease that is also making a return to prominence despite years of eradication efforts. 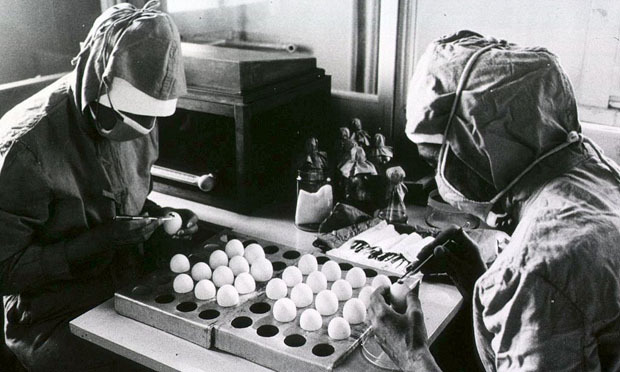 There has been much global progress — India and Southeast Asia became officially polio-free in 2014, for example — but the World Health Organization recently declared a global emergency after the rapid spread of wild poliovirus. Some of the countries affected by outbreaks, such as Pakistan and Syria, have underlying problems with rule of law and conflict that can make vaccination extremely difficult. Citation: Nyhan, Brendan; Reifler, Jason; Richey, Sean; Freed, Gary L. “Effective Messages in Vaccine Promotion: A Randomized Trial," Pediatrics, March 2014. doi: 10.1542/peds.2013-2365.